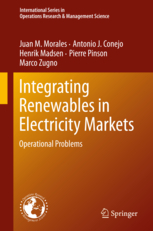 This book addresses the analytics of the operations of electric energy systems with increasing penetration of stochastic renewable production facilities, such as wind- and solar-based generation units. The modeling and forecasting of stochastic renewable power production. The characterization of the impact of renewable production on market outcomes. The clearing of electricity markets with high penetration of stochastic renewable units. The development of mechanisms to counteract the variability and unpredictability of stochastic renewable units so that supply security is not at risk. The trading of the electric energy produced by stochastic renewable producers. The association of a number of electricity production facilities, stochastic and others, to increase their competitive edge in the electricity market. The development of procedures to enable demand response and to facilitate the integration of stochastic renewable units.